Yemen’s Press and Publications Court (YPPC) has issued a summon statement against prominent investigative journalist, Mohammed Abdo Alabsi, to appear before court and interrogate him for his investigative reports, tomorrow. Alabsi who is renowned for his reports that revealed classified documents associated to Yemen’s defense minister, weaponry deals, illegal recruitment of thousands soldiers, money laundry in Yemen’s Central Bank, and other cases, would appear before YPPC to answer court’s questions related to his investigative report about the corruption revolving the medical treatment of Yemen’s uprising’s wounded people, titled “The New Thieves”. The report was the main story of the local independent newspaper, Aloula published in November, 2012. In that report he revealed shocking information based on interviews and classified documents from Yemen’s Justice Ministry that showed how a great number of money was exploited in the name of giving medical treatment to the wounded people of Yemen’s protests in 2011, while the medical treatment was only given to a small politicized group. “The New Thieves”, published in Aloula newspaper in November, 2012. However, it’s believed that Alabsi being questioned is not only for that report. For the past one year, he has actively published investigative reports in local press and his own blog that expose big politicians’ names in big influential positions in the government and enclosing several classified documents to prove his findings. Alabsi was not the only one who was summoned. His colleague Mohammed Ayash is summoned as well and they both plan to go to the court tomorrow and face the questioning. “It’s very disappointing from the current government to summon journalists and writers to courts, while the government still rejects providing medical treatments to the uprising’s wounded people who helped them to reach leadership positions. Personally, I’m not concerned about me being summoned, but I’m more concerned about using the wounded people’s cases to draw attention away from other reports with classified information,” tells me Alabsi. 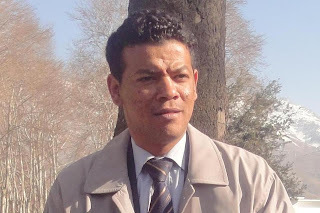 Alabsi is one of the few journalists who bravely reported on cases of corruption publicly, while Yemen’s main stream-media has failed to do so. In 2009, ousted president, Ali Abduallah Saleh’s government created YPPC, a special tribunal to interrogate and sentence journalists and writers if they break the law. Saleh has left power but freedom of press remains at risk even with the current new government.